One of Saxony’s romantic narrow gauge railways once ran from Wolkenstein to Jöhstadt. But on Friday, 13th January 1984, the last passenger trains ran up to Jöhstadt, and service to Niederschmiedeberg was discontinued on 31 December 1986. The Preßnitztalbahn railway was thus dismantled, with only a small museum in Großrückerswalde honouring its past. No one believed in a revival of the railway as one of the most famous German museum railways back then. In 1990, Günter Baumann, the former mayor of Jöhstadt and now member of the German Bundestag (CDU), left the engine shed in Jöhstadt to some railway enthusiasts who wanted to start rebuilding it. Although they were sneered at as weirdos, they have proved the contrary. The members of the IG Preßnitztalbahn, founded in 1988 as a chapter of the Culture Association of the GDR in Großrückerswalde, made “The wonder of Jöhstadt” come true. In 1992, the first tracks were laid – from a heating house station over a switch at the current coaling facility and back into the other station. That is how it all started on less than 100 m of tracks. Thousands of visitors came to watch the spectacle, even if no one could take a ride on the railway yet. But shortly afterwards, the first trains were puffing with one engine on each side of the train up to the rack of the railway, in about the hight of the present vehicle hall. That was the beginning of the museum railway operation. It took many stages to complete the railway line. After the station in Schlössel was accessible, the new section up to Loreleifelsen was opened and later Schmalzgrube station was reopened. During an awesome railway festival week in August 2000, the railway reached its final, restored station in Steinbach and the water house was put to its original use. Since the Preßnitztalbahn railway started its public service on 28 May 1993, almost half a million passengers have travelled on the trains of the museum railway. Thanks to the gradual extension of the line, trains have been running between Steinbach and Jöhstadtseit since 2000, carrying about 35,000 passengers a year. For timetable information, please visit the association’s website. Service is provided year round on this route. The association’s three own IV K steam engines, the VI K 99 715 (of joint owners) in operation on this line, the 99 4511, which was bought and restored by the IG Preßnitztalbahn, as well as several guest locomotives provide a great variety of operation possibilities. Often even multiple trains are operated on one track. The VSSB e.V. (association for the promotion of Saxon narrow gauge railways) transferred the I K No. 54 to the town of Jöhstadt for operating it. Hence this precious locomotive has been hauling a small train in the direction of the mountains. In the future, it will encounter all Saxon narrow gauge railways. As the vehicle for advertising the STEAM RAILWAY ROUTE, the locomotive promotes the narrow gauge railway not only on the tracks, but also on a heavy goods vehicle of the PRESS GmbH company at celebrations and festivas or fairs. A highlight of the association’s activities was, without a doubt, its 20th anniversary. The amazingly high number of 14 IV K steam engines arrived in Jöhstadt for this railway festival, which took place in the Schwarzwasser and Preßnitz valleys over several days. The locomotives starred as congratulants of a very special kind. Several train enthusiasts said this extraordinary event got under their skin, and many guests or tourists were affected by this special atmosphere. The festival was a perfect opportunity for advertising the Preßnitztalbahn railway in conjunction with the whole region, complementing each other perfectly. If you have not yet been in Jöhstadt, we warmly recommend that you take a journey on a special train or attend a themed event, giving you the chance to get to know the museum railway with its vehicles and systems. Grenzenlos wandern: Ausflüge in die nahegelegene tschechische Republik über die Übergänge in Jöhstadt oder in Schmalzgrube. Andreas Gegentrum Stolln: Besucherbergwerk einschließlich Bergbaulehrpfad im Preßnitztal zwischen Steinbach und Schmalzgrube. Wander- und Radwege: Bei einer gemütlichen Wanderung durch das Preßnitz- oder Schwarzwassertal kann man Natur pur genießen. Bergmagazin Marienberg: Hier ist das Museum sächsisch-böhmisches Erzgebirge zu finden, eine Ausstellung zur Kultur der Erzgebirgler. Saigerhütte Olbernhau-Grünthal: Museumskomplex mit Vorführungen des originalen Kupferhammerwerks, Freilichtmuseum und Schauwerkstätten. The Railway Museum is located in the Preßnitz and Schwarzwassertal, located in the central Erzgebirge between Annaberg-Buchholz and Marienberg. 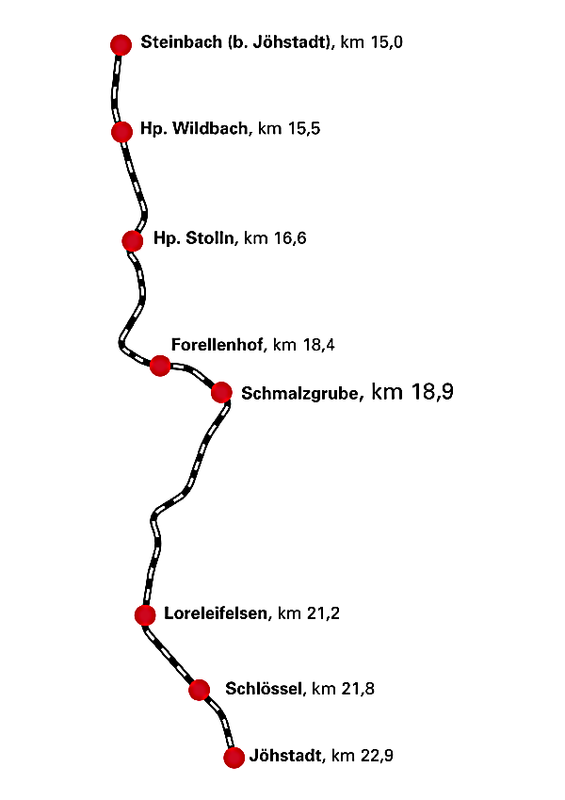 You can get there by car via the B101 to Selva, continue on State Road 220 about Streckewalde and Niederschmiedeberg to Steinbach. The Preßnitztalbahn runs on selected dates.